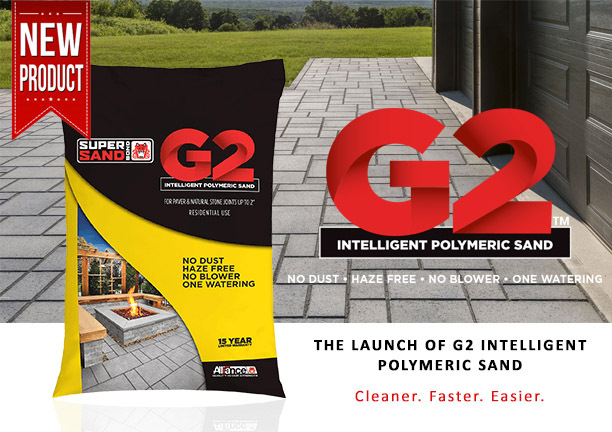 G2 Intelligent Polymeric Sand by Alliance is manufactured by mixing specifically calibrated sand with sophisticated intelligent polymers, which neutralize haze and dust. The end result: a second generation of polymeric sand unlike anything you’ve ever seen before. G2 Polymeric Sand simplifies the installation process. Sweeping is all it takes to completely remove the particles from the surface, thus eliminating the additional step of using a blower. And with its uniform composition, water is able to penetrate deeper through the G2 Polymeric Sand. This activates all of the intelligent polymers more evenly to form a stronger, more consistent bond, which only requires only one watering. Spread the G2 polymeric sand into the paver joints with a stiff bristle broom. Make sure the polymeric sand fills the joints completely. Tip: DO NOT USE OTHER MATERIAL IN THE JOINTS. Doing so will cause the polymeric sand to fail. Vibrate the G2 sand into the paver joints using a vibratory plate compactor. A rubber pad is recommended. A roller compactor is best for slab installation. Joints should be filled up to 3mm (1/8 in.) below the edge or chamfer. It is best to compact in several directions to ensure there are no air gaps or voids in the joints. Repeat steps 1 and 2 to ensure joints are filled and consolidated. Narrow joints require more care to completely fill. 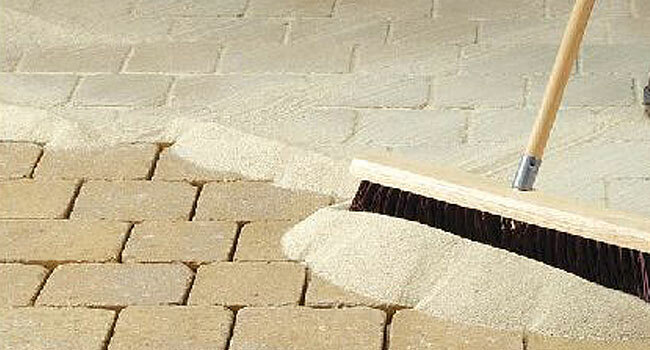 Using a stiff-bristle broom, remove any excess G2 sand from paver surfaces. Do the same with a soft-bristle broom. Make sure the finished sand level is at least 1/8 in. (3mm) lower than the chamfer of the pavers. Tip: Make sure the paver’s side and top surfaces are dry before applying the polymeric sand! The polymeric sand will harden if it is moistened and will adhere to the surface of the paver. 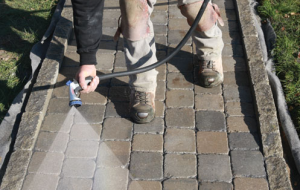 Once you have removed the polymeric sand from the surface of the pavers you can lightly mist the pavers and joints with a hose. Do this at a height of about 4 feet. Mist the area for about 1 minute starting at the lowest point. .Visit our website www.tlcsupply.com to view all Alliance products we carry and much more. Before you go check this out! You may even like our post on The Best Polymeric Sand To Use or How to Build a Paver Patio! We are happy to answer any of your project questions, just give us a shout! Leave your comments below.